ASIS International—the world’s largest association for security management professionals— will be exhibiting at the Sands Convention Center at booth #2109 on 10-12 April. Security professionals from across the entire supply chain throughout the globe come to Global Security Exchange (GSX) for the most comprehensive security education and innovative technology in the world. And only ASIS International has the expertise, influence, and resources to deliver the industry’s flagship event. Global Security Exchange is the world-class education, networking, and marketplace you have come to know and value—multiplied. Stop by our booth #2109 at the Sands Expo Convention Center, 10-12 April. Drop off your business card. That’s it—it’s just that simple! One winner will be randomly chosen each day at 2:00 pm at Booth #2109. Must be present to win! 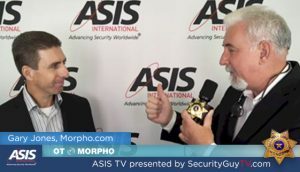 ASIS International has partnered with Security Guy TV and will be filming interviews with GSX exhibitors, speakers, and attendees from the ASIS/GSX booth at ISC West. These interviews will be used in exhibitor spotlights on the GSX.org website, as well as for previews of other great content and experiences you can expect at GSX, all of which will be shared via social media. GSX offers expanded opportunities for exhibitors to engage buyers on the show floor with exclusive show-only hours, lunches and happy hour, enhanced learning theaters, Innovative Product Awards, Career Center programming, and immersive learning format on the X Stage! GSX delivers a qualified audience of global buyers. It is the best place to connect with your target audience across the entire supply chain, including end users, systems integrators, and service providers—and show off your portfolio of products and services to thousands of buyers—all in one place at one time. It’s a global community. More than 25% of buyers are from outside the U.S.
Let’s discuss how we can support your business development goals. By joining ASIS International, you’ll align yourself with 34,000 global security professionals to network, share ideas and build relationships which will help you day-to-day and throughout your career to achieve success. As a member, you’ll have access to a vast array of resources and benefits to stay abreast of the latest trends, global developments and security innovations to mitigate risk and stay ahead of the curve. Stop by booth #2109 to learn more!